This recipe is high in carbs due to the bread. If you need to lower the carbs, use less bread for each sandwich or simply omit the bread all together and serve it on top of a serving of cooked quinoa or other grain. Place peppers, onion, and mushrooms in the bottom of a slow-cooker. Top with chicken, garlic, and pepperchinis (be sure to only add the pepperchinis and not the juice to decrease the sodium content). Then add broth and Worcestershire sauce. Cook on low for 4-5 hours or high for 2-3 hours. After cooking time has ended, shred chicken with a fork. To serve, hollow out the top and bottom of each baguette. *Option: after bread has been hollowed out, toast in a 400ºF oven, cut side up, for 3-5 minutes. 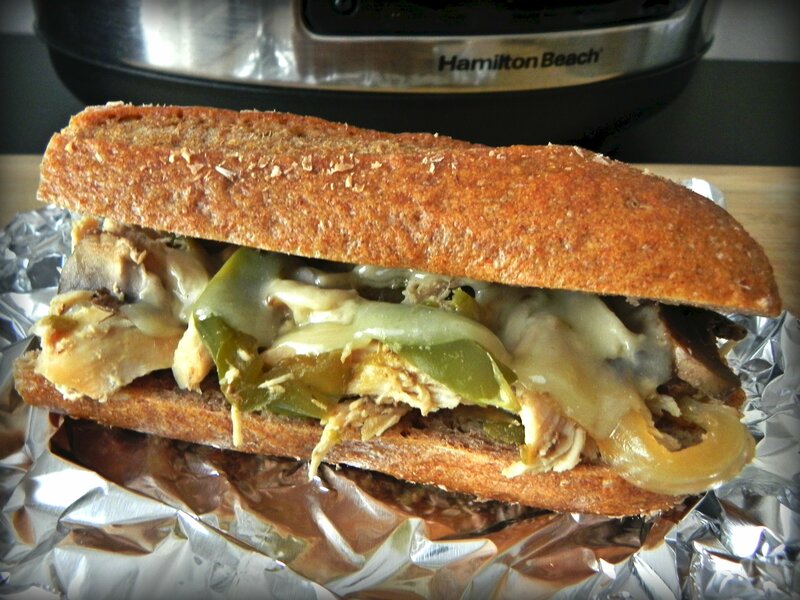 Add chicken to bread and then add peppers, onions, and mushrooms. Top with cheese if using. The cheese should melt from the heat of the chicken and peppers but if not, place sandwiches in the oven for about 5 minutes or until cheese is melted.